If given the opportunity could you live like this? Would you want to? We tried several years ago only to find it's not as easy as it appears here and truthfully, in the end, we didn't want it. I'm sure Mr. Coffer struggled from time to time etching out this lifestyle in those 25 years. Turns out we enjoy the company of others too much and we truly like entertaining. Having friends over for a comfortable dinner is important to us and, I'm not going to lie, I enjoy the smell of a bath towel fresh from the dryer. The challenge has always been finding the balance between the two worlds. We were fortunate enough to have the opportunity to build new, and for our area, our neighborhood—these woods—this is the best I could come up with. "Life ain't perfect and neither is my cabin." 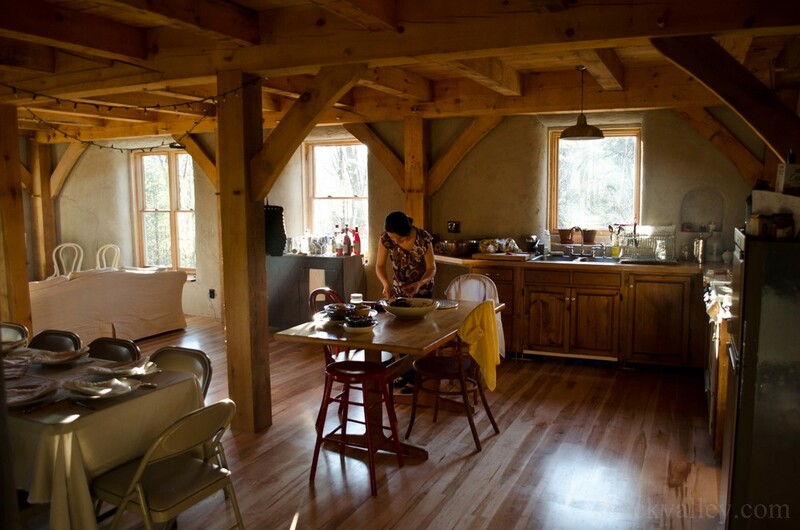 I do think we personally hit a nice middle ground between being off grid, using natural building materials, and still having most of the comforts of any modern home (we don't have a dishwasher). For Mr. Coffer, his balance is found between his 19th century agrarian ways and his wind generator, solar panels, and laptop computer — "blending the old, timeless things in with the latest technology to do the things that need to be done in life." For him it can be that simple and I admire that. Hats off to Lost & Found Films for showing us what starting over can look like and how someone like John Coffer can find that healthy balance and thrive. We should all be so lucky. At least we'll try right? In a quest to find a small wall-mounted sink with character we headed down to New York's great capital city of Albany.There, in a nondescript building located just off Central Avenue, is a warehouse filled with donated treasure that once outfitted the historic buildings and homes in and around the greater capital region. Within moments of walking through the doors we found our sink. Someone had just dropped it off and it hadn't made it back into the depths of the warehouse. Normally I enjoy the thrill of the hunt so our score was somewhat bittersweet. But instead of turning around and heading home, we spent some time digging through all the loot searching for possible solutions to ongoing projects and also imagining new ones. It's a great place to get creative. Without naming names, someone found a picture frame they had stashed away on a prior visit. The stars aligned and it made it to the car this time. Though not on the list, and not in the budget, secretly we were both hoping to find a decent claw foot tub. No luck. Most of the time if we don't find what we need it is because we're being too picky or too lazy. It's wise to enter this place knowing some effort will be needed to revive or customize something that has been laying around for years. You're only fooling yourself if you assume you'll walk out of there with something shiny and new and ready to be installed. However, there is the exception. We found our front door complete with all the original hardware and the original fitted jamb for just over $100. :Since 1978, the Capital District's only not-for-profit architectural salvage warehouse. Historic Albany Foundation strongly advocates the preservation of all historic buildings and encourages the retention of parts in their original settings. We accept donations only of historic salvaged parts which would otherwise have been destroyed or lost. We sell to architects, contractors, designers and do-it-yourselfers. The Architectural Parts Warehouse does not ship. Please visit us at our showroom to purchase items and view our inventory." If you plan on going don't forget your tape measure. And if you plan on going in winter, bring a coat. The Warehouse is only slightly warmer that the outside temperature.